It's snowing here in Wisconsin and my daughter has a snowday - no school! In this issue of my newsletter, I'd like to give you some information on a beautiful site in Northern Ireland and ask you for some help on my next project. Who was Finn MacCool? He was a giant who lived in Northern Ireland and wanted to do battle with the Scottish giant Benandonner. Finn built enormous stepping stones across the sea so he could reach his foe. Finn, however, saw his rival coming and ran back to Ireland where he asked his wife to hide him. His wife, Oonagh, disguised Finn as a baby and put him in a huge cradle. When the Scottish giant arrived, he took one look at the "baby" and assumed that the father must be truly gigantic. He ran back to Scotland across the stones, tearing them up on his way. 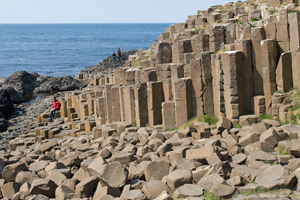 The rock formations that are left in northern Antrim and at Fingal's Cave on the Scottish island of Staffa are the two surviving ends of the Causeway built by Finn MacCool. You either like the tale of the giants or you may go for the scientific explanation that volcanic eruptions followed by cooling lava that split apart formed the basalt rock formations about 60 million years ago. Either story results in the beauty of the Causeway Coast. If you have a chance to visit Northern Ireland, don't miss it! Please let me know what topics you'd like to hear more about. I'm working on some special reports that my readers are asking for and would like your thoughts. If you have a minute, please reply to this email and give me an idea for my next report. What travel concerns do you have? What do you want to know about Ireland? What castles are you looking for? What Irish info can't you find? Thanks for any help you can give me. I hope your holiday season is going well! For Ireland travel advice and an experience of the beautiful landscapes, the stunning coastlines, the quaint villages, the thriving cities and majestic castles of Ireland, go to the Majestic Castles in Ireland website .